Incredible recreational compound on 28 Acres! Incredible 28 Acres! This one-of-a-kind recreational compound is less than 5 miles from Toledo Bend Reservoir (widely regarded as the No. 1 bass fishing lake in America), and includes 3 large and well-appointed homes, an enormous outdoor pavilion with an Austin stone fireplace, and an outdoor kitchen with standing appliances, a large infrared gas grill, granite countertops and plenty of seating. 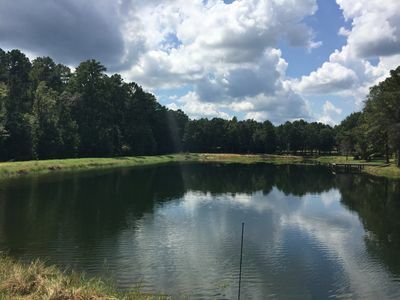 There are 2 deep well-water fed lakes, one with a white sand beach that makes it perfect for swimming or just splashing around, and another that is over 3 surface acres in size and has been stocked with trophy-sized Florida-strain hybrid bass. Both lakes have newly constructed wooden wharfs that make swimming or fishing a breeze. There are also numerous walking trails, patios, decks, fire pits, grills, porch swings and even a recently installed six-person hot tub. The property is surrounded by large-acreage neighbors, which makes it feel much larger and secluded than the legal description would imply. The active property management, careful maintenance and numerous opportunities for recreation or leisure make this a perfect venue for a corporate retreat or family reunion.